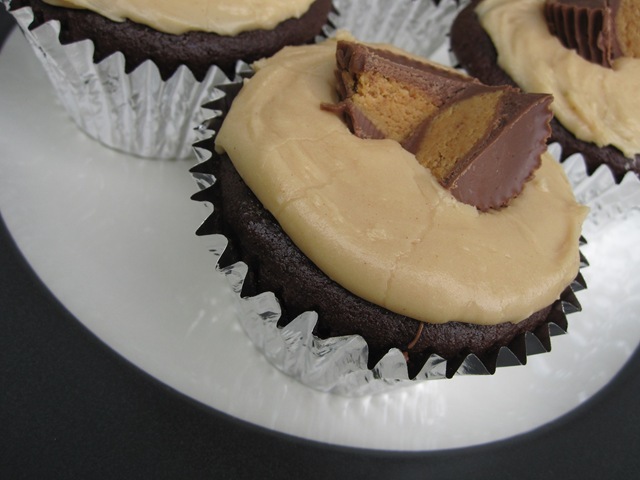 These Chocolate Peanut Butter Cup Cupcakes with Peanut Butter Frosting just can’t be beat! I’ve been thinking about this delicious combo for days now, but today was the day to make things happen. 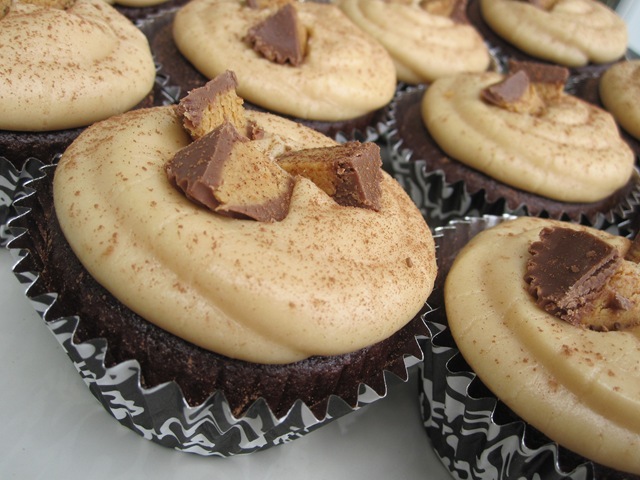 Chocolate + peanut butter = a match made in heaven! 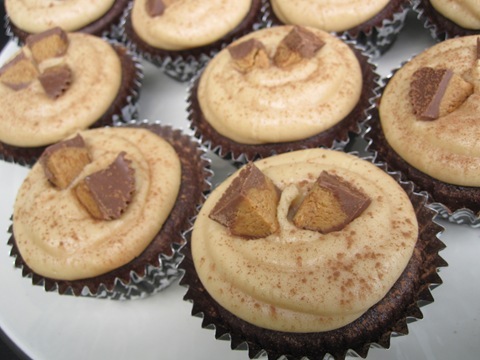 The use of a box cake mix makes these cupcakes come together in a breeze, but the homemade peanut butter frosting (and peanut butter cup surprise!) take them over the top. Mix cake mix, water, applesauce (or oil), and eggs according to directions on box (2 minutes on medium speed with electric mixer). If desired, add chocolate chips to the cake batter. Fill muffin pan with liners, and fill liners 2/3 full with batter. Bake according to directions on package, about 18-20 minutes. 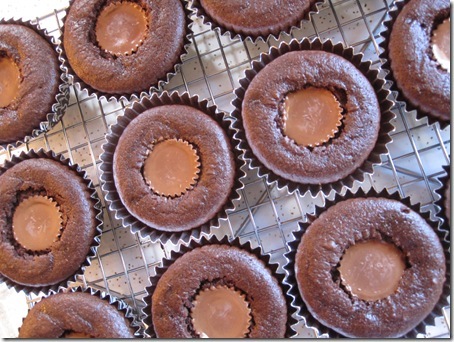 Allow cupcakes to cool for about 10 minutes, then gently press one peanut butter cup into each cupcake. Blend peanut butter, vanilla, and powdered sugar until combined. Add milk and mix on medium speed until smooth and creamy. Continue to add milk until you get the desired consistency. After frosting the cupcakes, top each cupcake with some extra peanut butter cups chunks & a dusting of cocoa powder, if desired. It’s important to put the PB cups in while the cupcakes are still somewhat warm; that way, they’ll get slightly soft and melted. You’re going to want to dig right in once you see things getting all melted and delicious, but I promise, it’s worth the wait for the frosting. Rather than making 24 regular-sized cupcakes, I made 14 regular sized + 6 jumbo cupcakes. 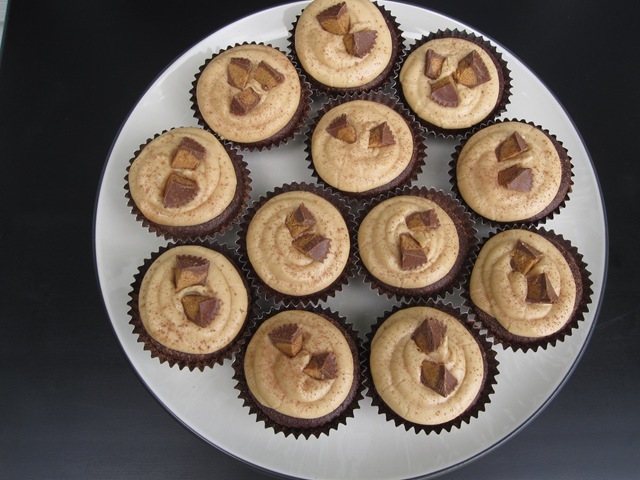 I’m telling you: If you’re as much in love with peanut butter + chocolate as I am, then you need to try these cupcakes. Your friends will thank you. Oh my gosh, I'm flying all the way to NY just to get 1 of these. Peanut butter and chocolate are my favs!!! omigoodness. i MUST make these!!!! Oh. My. God. Those look sooooooo good. Get in muh belly! Oh my word I'm dying right now! Those look AMAZING! Marry me, Courtney. These are gorgeous AND making my mouth water! You're so talented! umm I think I'm going to eat my computer screen now.. I need one of these asap! Definitely will be giving them a try, as I truly believe peanut butter and chocolate were destined for each other. These look gorgeous! I looove the cake cases! I don't like this blog! Do ya want to know why? . . . I'm staring down photos of chocolate/peanut butter cupcakes and thinking to myself, "two years ago, I might have had a chance to try one of these babies. . . Now all I get to do is look at them". :( Great job! I think you've found your calling. Andy P.S. We miss you. 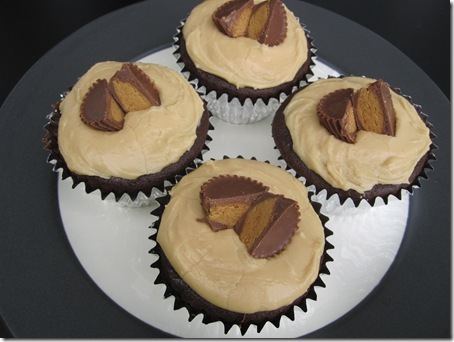 Chocolate and PB are my weaknesses..especially when put together!! 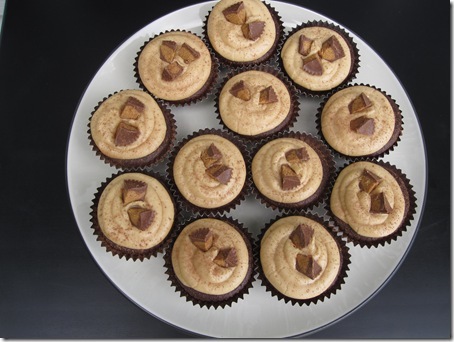 These look amazing and I'm sure they taste even better..yum! So creative! I make these sugar cookies that Keith loves. I put a thin mint in between 2 slices of raw sugar cookie dough. Seal the edges and then bake in the oven. So good!!! These look to die for!! I need these!!! Yummy!!!!!!!!!!! Ok - so the Strawberry Filled Lemon Cupcakes were a huge hit at the office bday (many props to you!). Thanks again for your encouragement. I have been elected to bring in cupcakes again next month for my boss's bday. 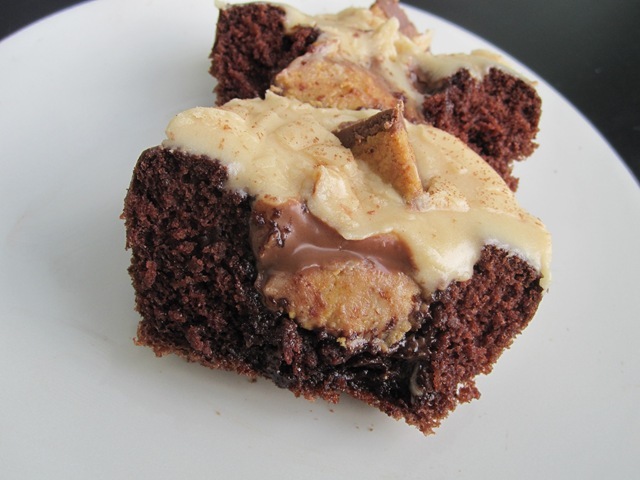 I'm thinking of trying out these chocolate peanut butter delights. I have been demanded by management at work to make some cupcakes for tomorrow. I am the team baker, so I am making these! Thanks for the recipe!!! Hahaha, no prob! Good Luck! THEY TURNED OUT FANTASTIC!!!!! 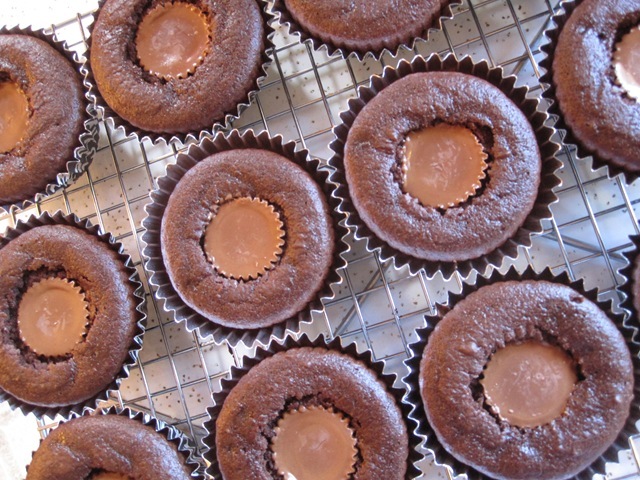 My tummy hurts from eating all the peanut butter cups. LOL Now, I want to master the key lime cup cakes I had from Betty's Cupcakery...any idea on what the heck is in the icing??? That will be my weekend project. 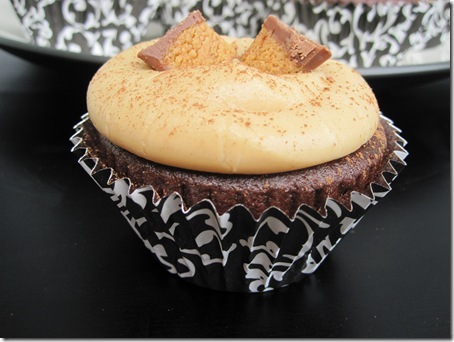 I made these cupcakes last weekend for a cookout and they were a huge hit! One question for you though, how do you make your frosting look so gorgeous!? Every recipe I see you make has beautiful frosting- I can't manage to get mine to look like that! Maybe you could do a frosting tutorial?! Or just give us some tips :) Anyway, great recipes, love the blog! 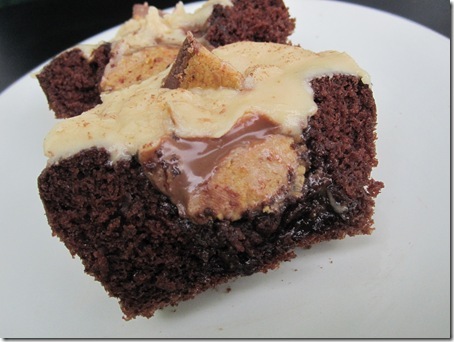 My recipe was on TasteSpotting? Really? Thank you, Leslie! So glad you and your friends liked them!